“These considerations speak a persuasive language to every reflecting and virtuous mind, and exhibit the continuance of the Union as a primary object of patriotic desire. Is there a doubt whether a common government can embrace so large a sphere? Let experience solve it. To listen to mere speculation in such a case were criminal. We are authorized to hope that a proper organization of the whole with the auxiliary agency of governments for the respective subdivisions, will afford a happy issue to the experiment. It is well worth a fair and full experiment. These famous words pre-date Abraham Lincoln by nearly 2000 years. Lincoln was himself quoting Jesus Christ. 70 years prior to Lincoln, Washington was espousing the same principles. A nation that desires to remain a nation for any amount of time must remain unified. Super long paragraph after super long paragraph, Washington has been hitting this point hard. One might be tempted to think that he was belaboring the idea a little too much. America should be united. Ok, we’ve got it! Sadly though, it is quite obvious, even to the casual observer, that we do not in fact “get it”. Far from wasting space, Washington was providing vital concepts that this burgeoning country would desperately need in the coming years. Even today, these concepts prove their worth over and over again. The necessity of unity becomes more and more apparent every single day. Washington begins this paragraph with a bold statement – continuing unity of the United States ought to be the primary object of patriotic desire. It would be one thing to say unity is important. 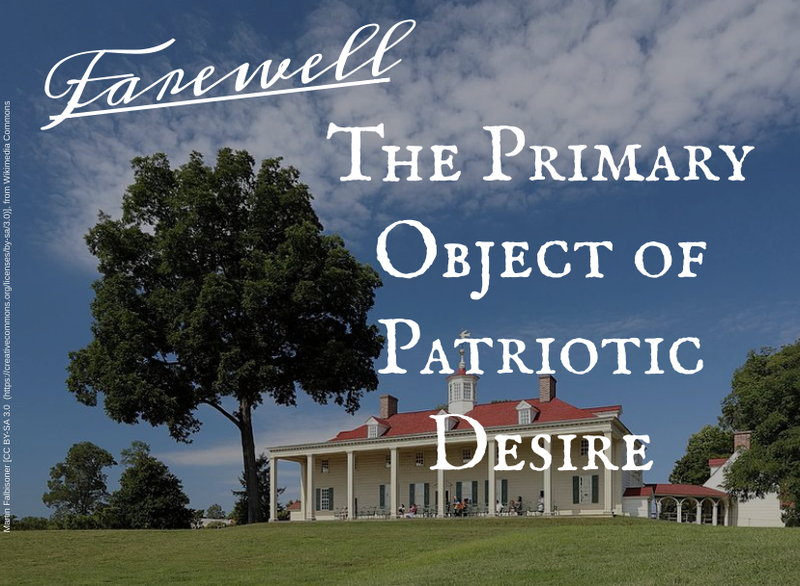 However, Washington goes all the way here, saying that it is the primary object. It should not be left until later, or ignored to the advancement of something else. If we desire to be patriots, it means that promoting unity will come first. One of the things that I love the most about our Founding Fathers was their spirit of adventurous experiment. Nothing quite like the United States had ever been attempted before. Yet they attempted it. Never had a colony of England, the country with the largest military and most powerful navy of the age, tried to break free from their oppressive monarch and succeeded. Yet they tried and succeeded. Never had such a vast swath of land, cultures, and peoples been united in a free, representative, constitutional government. Yet they united. “Sane” people would have said it was impossible. “Reasonable” people would have called it a waste of time. “Educated” people would have written it off as folly. Yet on they went on with the experiment. And the world has never been the same since. The very idea that such a large country could remain united without the iron first of a monarch was laughable. Washington is straight up. He asks the question that was on everyone’s mind – Can a government, like the one proposed, actually work over such a vast area of land? He then answers, let’s try it and see! The spirit of adventurous experiment. Whatever risk was involved was worth it. Finding out the answer was worth it. Something to note here is that Washington and the other Founders were not just cashing it all in on a mere hope and a prayer. They were not gambling with the future of millions based on nothing but their desires and hopes for a brighter future. The Founding Fathers were educated men. They understood history. They had studied, observed, and sought for the answers. They knew firsthand that monarchy was just another word for “tyranny of one”. They knew from careful study of history that Democracy was just another word for “tyranny of many”. They also knew from firsthand experience via their forefathers who settled Jamestown, that communism was just another world for “starvation and poverty”. You see, experiment will only take you so far unless you have facts and data to justify them. Washington is quite clear – the only way they would be justified in this experiment was if “experience shall not have demonstrated its impracticability…” Based off extensive study and a lot of firsthand experience and knowledge, they knew that not only was it practical, but it was the best shot at freedom around. One of the beautiful things about Washington’s Farewell Address is that he doesn’t pull any punches. This new country was truly his life’s work. He felt the weight of the responsibility that was laid upon him. He didn’t take leading a revolution lightly. He understood that the future of millions of people relied upon his actions. This is why it is so instructive to see how he responded to those who were against this idea of unity. He calls their patriotism into question. For someone like Washington who had put it all on the line in the name of country, there is likely no higher accusation that could be made. All this shows exactly how big a deal unity was and is to our country. I think the idea behind this quote holds true for unity. If you agree with Washington and believe that unity is a big deal, then you have a duty to practice it within your own sphere of influence. It is when individuals begin to take this responsibility seriously that we will begin to see a shift in the right direction.